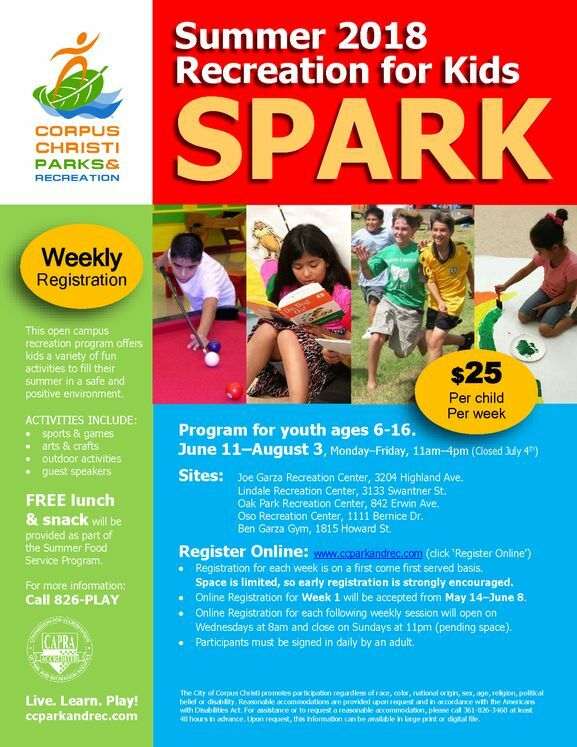 CORPUS CHRISTI, TX – This summer, the Corpus Christi Parks & Recreation Department invites youth ages 6 - 16 to add “S.P.A.R.K.” (Summer Programs and Recreation for Kids) to their summer plans. Children can enjoy an endless summer of fun where they can learn and grow in a recreational, social and active environment. Each day, participants can look forward to activities such as tournaments, arts and crafts, board games, indoor and outdoor play, guest speakers and more! A FREE lunch and snack will be provided for each participate. Space is limited, so sign up early! REGISTRATION: All attending youth must have registered and be accompanied by an adult each day. Online registration will be offered weekly on a first come first served basis at www.register.ccparkandrec.com for $25 per child per week. On-site registration will not be offered. Space is limited, so early registration is strongly encouraged. Registration for Week 1 will be accepted from May 14 through June 8. Registration for each following weekly session will open on Wednesdays at 8 am and close on Sundays at 11pm (pending space) prior to the upcoming week.